Things are getting very interesting around the San Onofre Nuclear Power Plant. 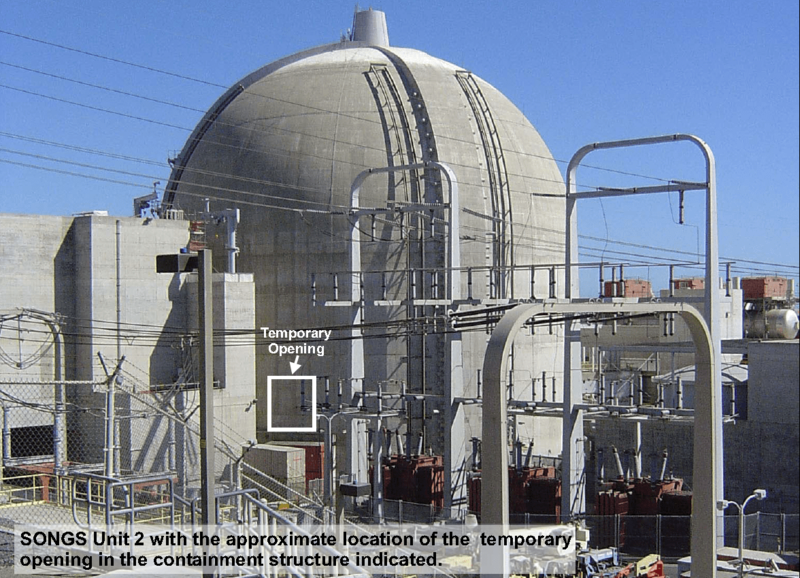 The Nuclear Regulatory Commission will send an Augmented Inspection Team (AIT) to the San Onofre Nuclear Generating Station to review the circumstances that led to three tubes failing a pressure test at Unit 3 yesterday. This brings scrutiny to San Onofres May 2011 inspection, where no active degradation mechanisms were found, no indications of tubing degradation were found, no tube plugging was recommended, and no tubes were plugged. On January 31, 2012, Unit 3 was shut down due to detection of a tube leak which was later determined to be caused by significant wear to multiple pipes. The two Unit 3 steam generators currently are undergoing extensive testing and inspections in order to fully assess their condition, as well as the cause of the Jan. 31 leak and the observed tube wear. On Wednesday, three tubes in Unit 3 failed a pressure test indicating they would be more likely to rupture during certain plant events that affect the pressure inside the steam generator. The test involves pumping water inside a tube and increasing the pressure while monitoring a pressure gauge to evaluate the integrity of the tube. NRC inspectors were on site for those tests, which consisted of the steam generator tubes being slowly pressurized with water in stages, using up to three times the normal operating condition pressure, according to the utility. The integrity of steam generator tubes is important because the tubes provide an additional barrier inside the containment building to prevent a radioactive steam release. Steam generators do experience some wear during the first year of operation but the level of tube wear at Unit 3 is unusual. The tubes undergoing this kind of testing are removed from service by plugging them, whether or not they pass the test. The NRC inspection team will review information associated with the design, construction, shipping, operation, and testing of the Unit 3 steam generators. The NRC will hold a public exit meeting with the licensee upon completion of the inspection to discuss preliminary findings. The LA Times reported that the agency will test 129 of the steam generator tubes in Reactor 3, as they show higher than normal wear. This is a very intriguing update, as 129 tubes falls well within the allowance that could be decommissioned and the generator restored to operation. It may indicated that there are bigger problems than 129 tubes at issue (although it could be more), or there is something else which is damaged inside the steam generators. If damaged were found affected the tube sheet plates, the shells, or anything else that could pose a threat to the safe operation of the reactor, it would become a big problem. Steam generators are crucial components of a nuclear power plant, by transporting the enormous amounts of heat generated inside of a nuclear reactor through U-tube heat exchangers, cooling and condensing it into steam which is then transferred to the turbine generator. The diameter of each tube ranges from 19 to 25 millimeters. Water from the reactor pressure vessel enters the steam generator through the “hot leg” pipe, circulates under pressure through the tubes, and exits through the “cold leg” pipe. Prolonged operation with degraded steam generators will ultimately increase radiation exposure and extend refueling outages due to the increasing need for extensive tube inspection and repair. Excessive steam generator plugging hinders coolant flow, which may require significant power reduction. In general, plugging is an operator’s initial response to degrading tubes. Steam generators are designed to have an excess number of tubes; therefore, tubes are generally plugged when they degrade. New steam generators have an even higher excess of tubes. All pressurized water reactor (PWR) nuclear power units placed in service before 1985 used first generation alloy 600 MA, including SONGS 2 & 3.This alloy degrades over time as a result of a variety of corrosion and mechanical factors, which includes stress corrosion cracking and flow-induced vibrations, causing tube wear to occur. Alloy 600 MA degradation affects all steam generators at SONGS 2 & 3. 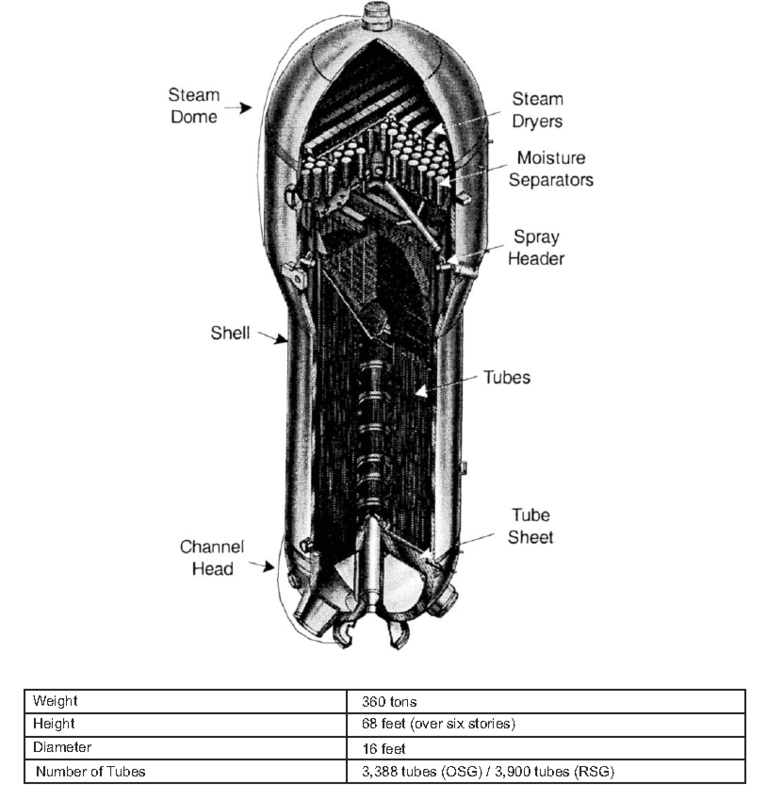 Newer steam generators use a third generation material known as Alloy 690 (SCE, 2004c). Mitsubishi Heavy Industries received the replacement steam generators (RSGs) order from the licensee in September 2004 after winning an international bidding competition. Fabrication, delivery, and onsite preparation of these generators requires a lead-time of approximately five years. This manufacturing time depends on the backlog at the steam generator manufacturing facility, including the tubing mill and foundry. Most news reports don’t tell the full story relating to steam generator issues in US nuclear power plants, let alone San Onofre, a troubled operation, which is often used as an inside joke among those in the industry. When a utility decides to replace its steam generators, it must go through extensive planning efforts that include examining the extent of damage to the steam generators, estimating the length of time required to replace the steam generators, deciding whether a partial or complete steam generator replacement is needed, and determining the cost associated with replacement. Southern California Edison has not been quick to reveal the history of these trouble steam generators, which were so flawed in final testing in Japan before shipping, that they were forced to be completely disassembled for rework prior to completion. Compared with a typical steam generator for a nuclear reactor, the RSGs for SONGS are about 1.5 times larger in size and heavier in weight, and contain almost triple in the number of heat transfer tubes. The replacement steam generators were manufactured at the company’s Kobe Shipyard & Machinery Works, and are the world’s largest, each measuring approximately seven meters (22 feet) in external diameter, weighing 580 metric tons and housing approximately 10,000 heat transfer tubes. On March 18, 2009, MHI conducted a routine visual inspection on the SONGS Unit 3 “B” RSG and discovered a 5-inch long crack in the metal welds. After discovering this weld flaw, MHI conducted additional inspections with penetrating dyes and ultrasonic equipment to perform examinations on all the divider plate to channel head welds in both SONGS Unit 3 RSGs. With the expanded inspections, MHI found several small surface flaws in the Unit 3 “A” RSG that was being manufactured at the same time. In addition, in both Unit 3 RSGs, examinations revealed that almost all of the alloy under the divider plate and some stainless steel cladding adjacent to the divider plate had detached. When plant workers recently were inspecting the welding around the two 640-ton steam generators in Unit 2, they found air pockets in some of the welds on one generator. The two generators, which surround the nuclear reactor, are each welded to the ground in three spots under a containment dome. Safety standards call for no air pockets, so plant operators used robots to repair the affected areas. X-rays showed there are no more air pockets in the welding. Will SONGS and the NRC be able to absolutely guarantee the integrity of new the Steam Generators and that the startup testing will not expose new manufacturing or installation flaws that challenge nuclear safety? That is the big question; if not then San Onofre may be forced to look at replacing the steam generators again, or possible early decommissioning. It could be potentially more expensive then the recent replacement, as replacement power costs are added to the steam generator replacement cost depending on whether the replacement occurs during an outage already required for a refueling or maintenance outage. Ordinarily, the steam generator replacement coincides with a normal refueling or maintenance outage. If the replacement is carried out during a scheduled outage, the steam generator replacement activity is charged only for the time it adds to the outage. This is a difficult decision, one that must be based on technical and cost analyses and license terms. Steam generator problems contributed to the premature shutdown of the Trojan nuclear unit and the shutdowns of the Rancho Seco and San Onofre Unit 1. Additional premature shutdowns are not out of the question. Premature shutdown creates two major decommissioning problems. First, if a plant is shut down 10 years prematurely, the decommissioning trust is likely to lack at least three-quarters of its decommissioning total. Second, decommissioning requires extensive planning many years in advance of actual decommissioning activity. Deferring these activities and conducting the planning on a non-emergency basis has significant value to a utility. The savings from eliminating repeated tube plugging, extra maintenance and inspection work, and so forth can be millions of dollars per year. Tube ruptures also prompt intense scrutiny by the NRC and probably additional attention from State regulators and the public. The savings from avoiding a forced outage due to a tube rupture are difficult to quantify but could certainly amount to tens of millions of dollars, depending on when in the operating cycle the rupture occurred; for example, if a tube ruptures immediately before a refueling outage the utility would be able to conduct maintenance and repairs on the steam generator during the refueling outage. All fuel would be removed from the reactor vessel before the original steam generators are removed from their enclosures. SCE would move the reactor fuel to the used fuel pool. SONGS 2 & 3 is an unusually compact site, presenting significant challenges for locating temporary facilities and material staging. The equipment hatch into the containment structure cannot be used because it is located at grade, making it impossible to lift and orient the replacement steam generators. Crane operations to remove the old units and replace them with the new ones will involve weights that will shift signiﬁcantly as the steam generators are moved from a vertical to a horizontal position for removal. This required that a temporary construction opening be created in the containment structure of each unit, which in turn required removal and restoration of containment tendons. De-tensioning tendons of the type at SONGS 2 & 3 was never been attempted at another operating nuclear plant. Most of the tendons are not designed to be de-tensioned or removed. The containment building of each unit would be opened by cutting the reinforced concrete walls, over four feet thick, the interior steel liner, and the vertical and horizontal steel tendons that reinforce the containment. To perform steam generator replacement, an opening approximately 28 feet by 28 feet would be reopened in each containment building above the existing equipment hatch. Upon completion of steam generator replacement, the opening would have to be re-re-sealed and the containment building returned to its original configuration and integrity. Problems associated with actual degradation pose reliability, regulatory and in some cases safety concerns. As nuclear power plants age and move into license renewal, the impact of the radiation environment on the susceptibility to degradation increases. Metal materials degradation and aging have been problematic for commercial light water reactors since the mid-1970s (e.g., PWR steam generator tube leaks, BWR recirculation pipe cracking, BWR reactor vessel internals issues, PWR reactor pressure vessel head penetration cracking and leaks). Fatigue failure and primary-to-secondary leaks have occurred in three steam generator tubes caused by significant deposit accumulation on the tube support plates. Unacceptable levels of deposit accumulation can result in stress corrosion cracking, and other types fatigue failure of steam generator tubes. This can be severely costly for a nuclear power plant as it can lead to an unplanned outage, an unplanned tube plugging campaign, a reduction in power output, reduction in the maximum allowed power level, and/or primary-to-secondary leakage. Foreign objects on the secondary side of steam generators cause tube wear that can challenge tube integrity and can lead to primary-to-secondary leakage and unplanned outages. This is currently the number one cause of steam generator forced outages. Foreign objects include material that is accidentally left in the secondary system during installation or repairs, and material from degraded components in the secondary system. Although foreign material exclusion programs are in place at plants to minimize the number foreign objects in the secondary system, it is not possible to eliminate all foreign objects. Denting of steam generator tubes at the top of the tubesheet has occurred at seven plants. Denting occurred in as many as 1,500 tubes in a single plant and caused stress corrosion cracking and tube repair in three of the plants. Stress corrosion cracks are being detected in Alloy 600TT and Alloy 800NG steam generators. In plants that have implemented power uprates, deposit accumulation has limited thermal performance. Because of operational-related degradation, most steam generators constructed in the 1960s-80s have been replaced. In 1993, the NRC found “no end in sight” to steam generator tube cracking problems at plants operating with original steam generators. By 1994, approximately 38,000 tubes, or 0.9 percent of all the tubes in operating steam generators in the United States, were known to have been plugged. In general, 15 to 20 percent of the tubes may be plugged before replacement or derating is required. The U.S. Nuclear Regulatory Commission recently published Information Notice 2010-21, which states that plants with Alloy 600 thermally treated tubing may not be inspecting the most susceptible tubes in the U-Bend region. There are 46 units in the US with 690TT tubing. Some plants have experienced a large number of indications in the first inservice inspection, while others have experienced a large growth of numbers of indications in subsequent inspections. Utilities are continuing to make adjustments to their systems to prolong steam generator life. Denting of steam generator tubes at the top of the tubesheet has occurred at seven plants. Denting occurred in as many as 1,500 tubes in a single plant and caused stress corrosion cracking and tube repair in three of the plants. Currently, the most common form of failure is intergranular attack/stress-corrosion cracking. This form of failure now accounts for 60 to 80 percent of all tube defects requiring plugging. Fretting and pitting combine to account for another 15 to 20 percent of all tube defects. The remaining failures are attributed to mechanical damage, wastage, denting, and fatigue cracking. Initially, the problems were thought to be isolated incidents resulting mainly from defects in manufacturing, poor operations, poor water chemistry, and other factors. Over time, however, a pattern of failures began to emerge, suggesting common factors and common failure modes, while a viable strategy to recognize and mitigate these weaknesses is still being sought.